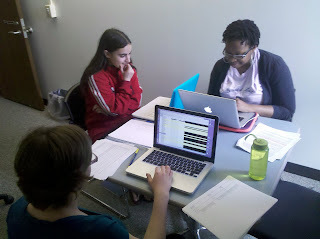 CIRI research associate and UConn doctoral student Corinne Tagliarina (bottom left) works on Foreign Movement ratings with undergraduate research assistants Carly Calabrese and Erin Franklin (L-R). The CIRI Human Rights Data Project is now in full swing at both its University of Connecticut and Binghamton University, SUNY, research sites. Each year, CIRI's senior staff works with teams of undergraduate and graduate research assistants to begin the process of rating government respect for human rights across the world for the previous year. The data-creation process, from beginning to end, will involve more than 30 persons, take about 8 months total, and culminate with the official release of the new data on Human Rights Day, December 10th.